The Sea Chest Oyster Bar and Restaurant has been serving fresh seafood for over twenty years. Located a stone's throw away from the beach, it has remained a popular stop over point for visitors traveling from Los Angeles, San Francisco and the Central Valley. Locals have always enjoyed sitting at the Oyster bar and chatting with the entertaining chefs while their dinner is prepared exhibition style. Established in 1975 by Jim and Karen Clarke, the Sea Chest has maintained a cozy atmosphere reminiscent of a quaint New England seaside cottage. Whether you're seated in the lively front dining room enjoying the view of the Pacific, or in the quieter warmth of "the back room", next to the pot belly stove, you are sure to be served the freshest seafood available from local waters and from around the world. The menu at the Sea Chest is full of specialties. John D's Oysters Rockefeller, Steamed Clams, and fresh New Zealand Mussels are just a few of the favorite appetizers offered nightly. The entrees offer a varied selection of the freshest fish available and all is broiled to perfection, served with salad or New England Clam Chowder and vegetables. The Sea Chest is well known for it's Halibut and Salmon but the often featured specialty of the house is Cioppinno. The Australian Lobster Tails and the Alaskan Crab Legs are a seafood lovers delight ! To compliment your dinner, the Sea Chest offers a wonderful selection of California wines with an emphasis on the best of the Central Coast. In addition to the wine list, many popular beers are offered including several microbrews and imports. After dinner you may like to try a glass of Port or Sherry with one of the delicious house desserts. The Sea Chest provides a comfortable and fun game room should you have a short wait for your table. Checkers, chess, cribbage and cards along with other games of strategy have become an expected pre-dinner ritual with many of the returning patrons. often while pouring a glass of wine, clearing plates or shucking oysters ! 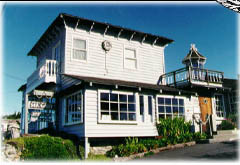 The Sea Chest Restaurant and Oyster Bar is located at 6216 Moonstone Beach Drive, Cambria, and opens daily at 5:30. Between mid September and May 1st it is closed on Tuesdays. If you would like more information please call 805-927-4514. Neither credit cards nor reservations are accepted. For the pleasure of all diners, the Sea Chest is a nonsmoking restaurant.